Britz Flei1990. Copy of paper on lenr-canr.org. cm-3) is 102 – 103 times larger than the enthalpy of reaction of chemical processes. This paper was intended to be the full monte, the earlier paper Britz Flei1989a being a preliminary note. By this time they knew what a firestorm of critique had been raised. It would be crucial that this paper be bulletproof, as to what it confidently claims, and that any speculations or weaker inferences be stated as such, if at all. Fleischmann and Pons were suffering from a disability: they had seen the aftermath of a meltdown, probably in late 1984. They had no possible chemical explanation for the extremity of that meltdown. So they were convinced that nuclear-level heat was possible, and they treat that as a fact. But almost nobody else witnessed that meltdown, they appear to have actively concealed it. They published little about it, beyond stating the size of the cathode (1 cm3), nor has there been any report that they kept the materials, what was left of the cathode being the most crucial, as well as fragments from the incident. They did not report if the power supply, when they discovered the meltdown, was on or off, and, in particular, what current it was set to deliver, assuming constant current. It has only been stated (Beaudette, Excess Heat, 2nd edition, 2002, p. 35) that they had raised the current to 1.5 A, and that Pons’ son had been sent to turn it off for the night. Fig. 12. 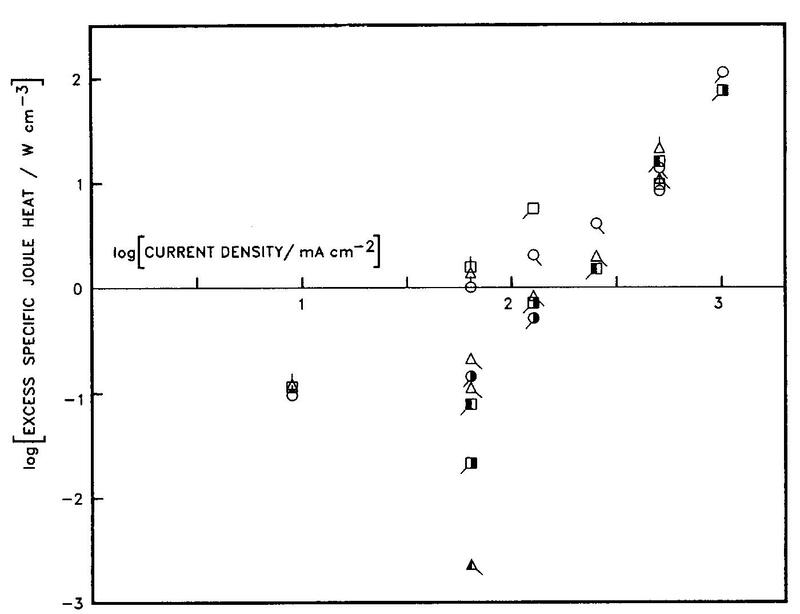 Log-log plot (excess enthalpy vs. current density) of the data in Tables 3 and A6.1. And then I used https://www.pdftoexcel.com/ to convert, in a flash, the Tables 3 and A6.1 (preprint pagesˋ19 and 52) to Excel spreadsheets, which can be opened by many spreadsheet programs. On my iPhone, they immediately opened as spreadsheets. There are some errors to be cleaned up, but the data looks good.